Whether you want to create a faux glow on winter white skin, or accentuate an already earned tan, it helps to know a few makeup artist tips on how to apply liquid bronzer to the skin. I gottcha covered! I’m going to talk about how to use liquid bronzer, where to put it (face and body), and share my favorite drugstore bronzer of choice. So there are about a million bronzer products out there. Which kind is best for you? If you aren’t quite sure whether liquid bronzer or powder bronzer is the right choice for you, first check out How to Fake it… Choosing Bronzer to help you make that decision. I also wrote an article all about makeup tips for how to apply powder bronzer in How to Apply Powder Bronzer. But liquid bronzer is my favorite bronzer of choice if you want that dewy skin look. 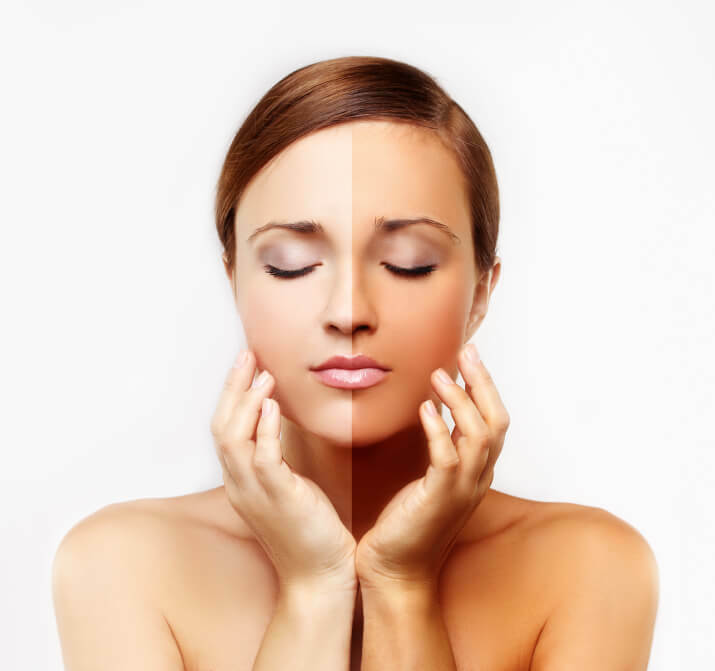 Many of the glowing, bronzed skin looks created by makeup artists are used with liquid bronzer. Liquid bronzer is concentrated with iridescent, light reflective ingredients and is easily blended into foundation. So if you see a model in a fashion magazine with a hyperreal bronze glow to her skin, you can be sure that the makeup artist used liquid bronzer because of it’s texture and ability to reflect light. 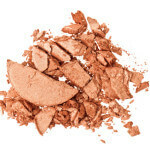 Powder bronzer tends to look more natural and is a little more friendly. But, it will also be a little more flat and never give quite the same “glow”. 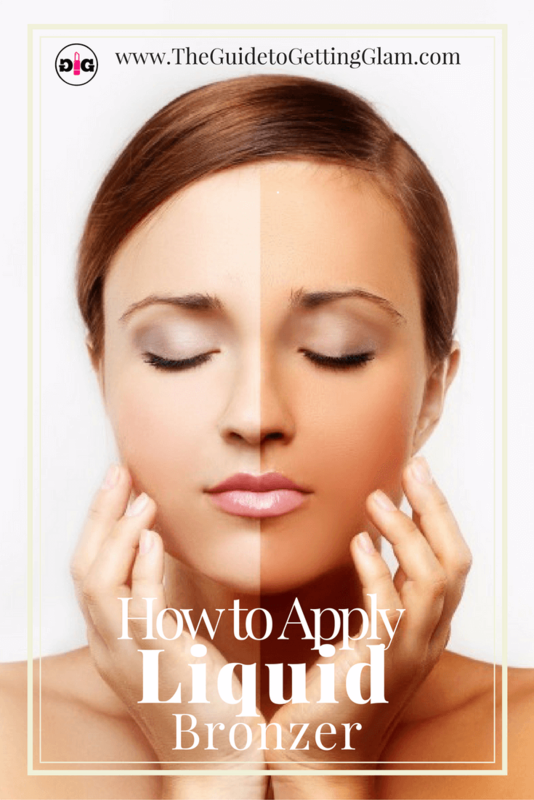 Liquid bronzer is also a great option for those who want to skip foundation altogether. On no makeup days, just mix a little liquid bronzer into your moisturizer and be done with it. 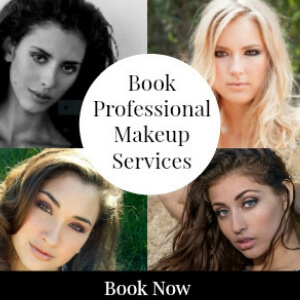 *Also check out Summer Makeup Tips to find out easy ways to summer-proof your makeup. My favorite drugstore liquid bronzer is Maybelline Master Strobing Liquid. *Are you loving these makeup tips? 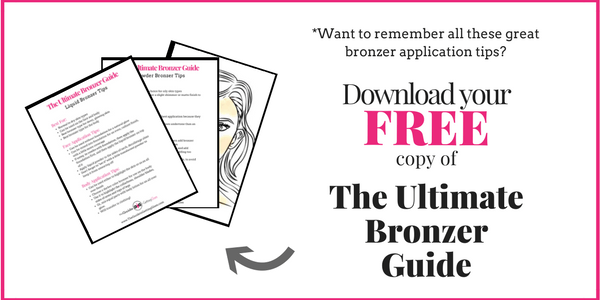 I created a FREE download for you called The Ultimate Bronzer Guide that you can print out! It has all of my best makeup tips for liquid and powder bronzer, and also a cheat sheet for where to put bronzer. 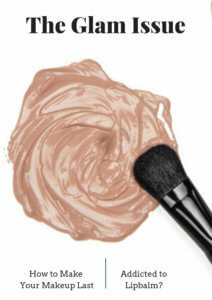 First begin by putting your liquid or cream foundation onto your skin as your base. The foundation will even out your skin tone and create a nice texture on the skin. This will help to grab the liquid bronzer and hold it into place. Then, apply the liquid bronzer on top of the foundation. 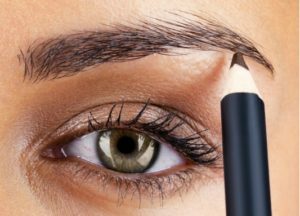 A little bronzer on the cheeks and high plane (middle) of the forehead, and then on either side of your neck should do. The best tool to apply liquid bronzer? Your own fingertips. 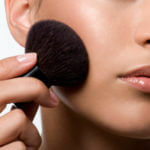 A sponge will absorb too much liquid bronzer and waste a lot of your bronzer. The texture of the sponge can also create “spackle marks” on your cheeks. Nobody wants that. But, your fingertips can smooth and blend the liquid bronzer onto your skin. For areas you want a little more intensity of color, just tap the bronzer into your skin. Liquid bronzer is also very versatile, as you can easily apply it to both the face and the body. 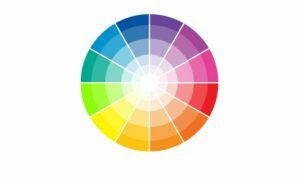 It is the best choice for adding a little color to the arms, legs, and other exposed areas of the skin. 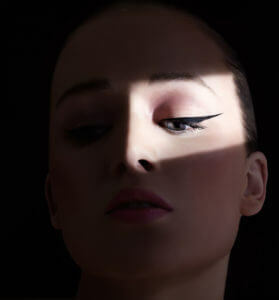 First decide whether you want to highlight certain areas of the skin, or whether you want an all over glow. If you just want to accentuate certain features, then you can apply the liquid bronzer only to those areas… maybe touch a little liquid bronzer on your collarbone, shoulders, decolletage. For a more even application onto the body, I recommend mixing equal parts body lotion and liquid bronzer. Mix them both into your hands before adding bronzer to the skin. Doing this will help dilute the bronzer a little and give your skin an all over shimmer. *Warning, most liquid bronzers do not “set” all the way as some self-tanners and spray tans can. So beware that any bronzer that you add to your body can and will rub off on your clothes. Wanna see these liquid bronzer makeup tips in action? I created this video just for you! 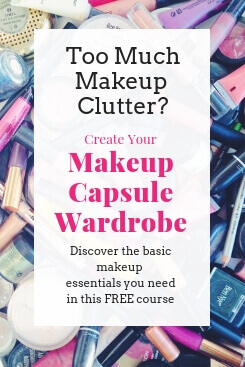 I hope these makeup tips help! 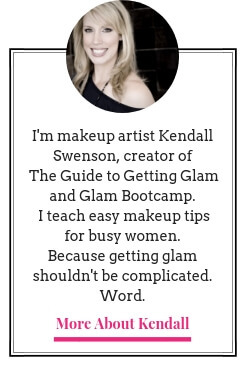 If you would like to learn about all the ways I can help you get glam, please visit my GetGlam page. Makeup questions? 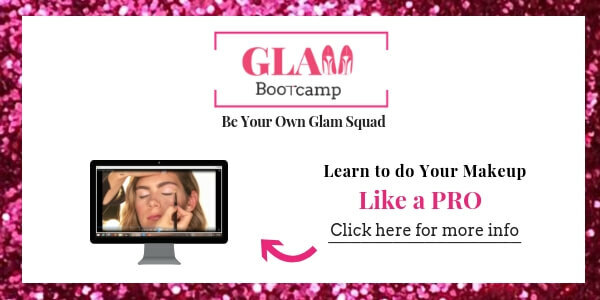 Ask me at the Glam Facebook Page! And don’t forget to download your FREE copy of The Ultimate Bronzer Guide below! How to Match Foundation... in a Hurry! Thanks for the advice, I will have to try this Maybelline bronzer. Absolutely! Let me know how it works for you.